May 21, 2014 - Austin, TX Nina Diaz, lead singer for the acclaimed San Antonio-based indie band Girl in a Coma, announces the debut performance of her solo project. 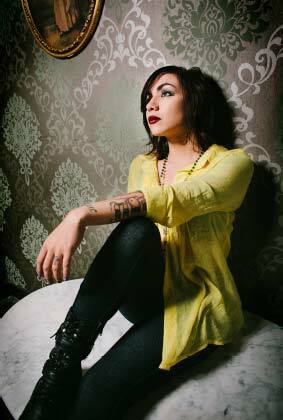 Nina Diaz, has been hailed by KUT and NPR as "one of the two or three most exciting, scarygood vocalists in rock today." Diaz began her career at the age of 13 when Girl in a Coma was started. After 10 years of performing as front person for the band, Diaz decided to take a break from the band this year to explore music that is all her own. Fresh from a month of working on new material at West Texas' Sonic Ranch Material, Nina returns to the stage in a series of intimate concerts on the inside stage at The Belmont in Austin, Texas. Nina will front a full, five-piece band that will perform these original songs for the very first time. Her backing band, hand-picked by Nina to highlight her new sound, will include Justin Carney (bass), Jorge Gonzalez (drums), Jaime Ramirez (keys) and Travis Vela (guitar). Her hour long set each night will include over a dozen new songs that have never been released, and many never heard before in public. Each night of the residency will feature a different opening act (to be announced soon). Advance tickets are only $5 while they last and are available at thebelmontaustin.com or ticketfly.com.